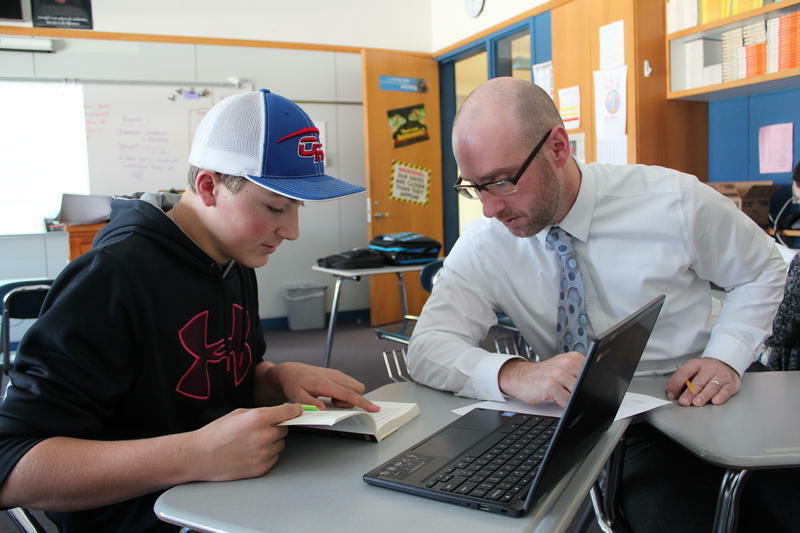 Oak HillIn this Dec. 13, 2017 photo, Oak Hill High School Principal Marco Aliberti works with a student in English class as part of a revamped course structure at the school, part of RSU 4, northwest of Lewiston. This session, lawmakers have heard proposals to delay the diplomas even further and to largely get rid of the graduation requirements. With a newly drafted bill, the state Department of Education says it wants to fix the law but still hold schools accountable. "We think our bill sets a very clear requirement for the diploma," says Mary Paine, the director of strategic initiatives for the department. "And go from there." Paine says the new bill would repeal many of the requirements that are set to go into place in three years. Students would no longer need to be "proficient" in up to eight content areas to graduate. Instead, they would only need to meet the state's eleventh- and twelfth-grade standards in two subjects: English and math. Students with disabilities, meanwhile, could be granted modifications, if needed. Paine says she hopes that the new diploma, as proposed in the department's bill, would still set a statewide graduation standard. But she says it would grant more flexibility in how schools teach students, and what they require of them. "And I think a lot of the approach here is to make sure that we say, 'Here's what the diploma means.' And let's talk about how we get students there," Paine says. And the department's bill won't be the only change under consideration at the State House. Republican State Rep. Heidi Sampson is putting forward a bill that would repeal the proficiency-based diplomas entirely. She says the proposal would give control back to teachers and schools. "The only way we can do that is, bring it back to more of a local control place, where local control determines what's best for kids," Sampson says. A public hearing on both bills is scheduled for Monday, and policymakers are hoping to get testimony from an array of stakeholders, including teachers and parents. But the House and Senate will need to act quickly. The Legislature is scheduled to adjourn in less than two weeks.